With Thanksgiving just past, many of us are looking forward to a break before the next growing season. 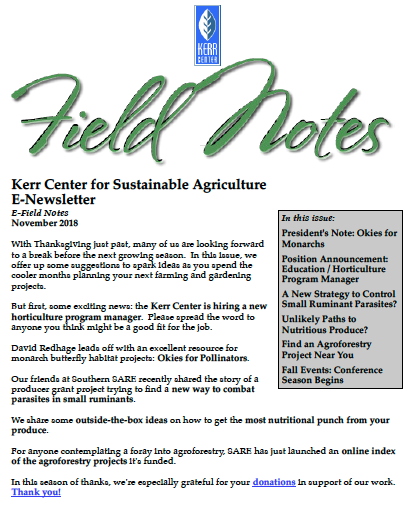 In this issue, we offer up some suggestions to spark ideas as you spend the cooler months planning your next farming and gardening projects. 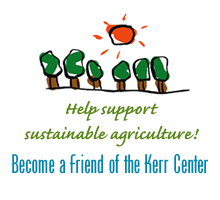 But first, some exciting news: the Kerr Center is hiring a new horticulture program manager. Please spread the word to anyone you think might be a good fit for the job. David Redhage leads off with an excellent resource for monarch butterfly habitat projects: Okies for Monarchs. Our friends at Southern SARE recently shared the story of a producer grant project trying to find a new way to combat parasites in small ruminants. We share some outside-the-box ideas on how to get the most nutritional punch from your produce. For anyone contemplating a foray into agroforestry, SARE has just launched an online index of the agroforestry projects it’s funded.